"Kanuni" redirects here. For the hompa of Kwangali, see Kanuni (hompa). For the Albanian law texts, see Kanun (Albania). 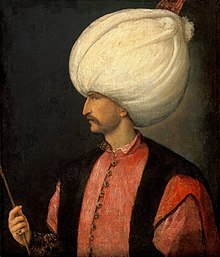 Suleiman I (Ottoman Turkish : سلطان سليمان اول‎Sultan Süleyman-ı Evvel; Turkish : Birinci Süleyman, Kanunî Sultan Süleyman or Muhteşem Süleyman;  6 November 1494 – 6 September 1566), commonly known as Suleiman the Magnificent in the West and Kanunî Sultan Süleyman (Ottoman Turkish : قانونى سلطان سليمان‎; "The Lawgiver Suleiman") in his realm, was the tenth and longest-reigning Sultan of the Ottoman Empire from 1520 until his death in 1566. Under his administration, the Ottoman state ruled over at least 25 million people. Ottoman Turkish, or the Ottoman language, is the variety of the Turkish language that was used in the Ottoman Empire. It borrows, in all aspects, extensively from Arabic and Persian, and it was written in the Ottoman Turkish alphabet. During the peak of Ottoman power, Arabic and Persian vocabulary accounted for up to 88% of the Ottoman vocabulary, while words of foreign origin heavily outnumbered native Turkish words. Turkish, also referred to as Istanbul Turkish, is the most widely spoken of the Turkic languages, with around ten to fifteen million native speakers in Southeast Europe and sixty to sixty-five million native speakers in Western Asia. Outside Turkey, significant smaller groups of speakers exist in Germany, Bulgaria, North Macedonia, Northern Cyprus, Greece, the Caucasus, and other parts of Europe and Central Asia. Cyprus has requested that the European Union add Turkish as an official language, even though Turkey is not a member state. The Western world, also known as the West, refers to various nations depending on the context, most often including at least part of Europe, Australasia, and the Americas, with the status of Latin America in dispute. There are many accepted definitions, all closely interrelated. 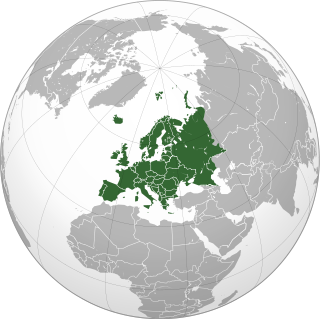 The Western world is also known as the Occident, in contrast to the Orient, or Eastern world. Rhodes is the largest of the Dodecanese islands of Greece and is also the island group's historical capital. Administratively the island forms a separate municipality within the Rhodes regional unit, which is part of the South Aegean administrative region. The principal town of the island and seat of the municipality is Rhodes. The city of Rhodes had 50,636 inhabitants in 2011. It is located northeast of Crete, southeast of Athens and just off the Anatolian coast of Turkey. Rhodes' nickname is The island of the Knights, named after the Knights of Saint John of Jerusalem, who once conquered the land. Ebussuud Efendi was a Hanafi Ottoman jurist and Qur'an exegete. He was also called "El-İmâdî" because his family was from İmâdiyye. Qanun is an Arabic word. It can refer to laws established by Muslim sovereigns, in particular the body of administrative, economic and criminal law promulgated by Ottoman sultans, in contrast to sharia, the body of law elaborated by Muslim jurists. It is thus frequently translated as "dynastic law". The idea of kanun first entered the Muslim World in the thirteenth century, as it was borrowed from the Mongol Empire in the aftermath of their invasions. 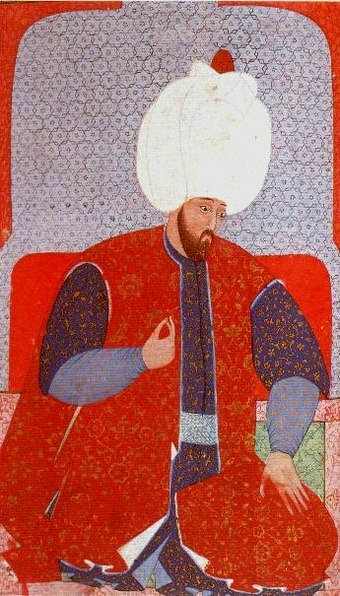 The 10th sultan of the Ottoman Empire, Suleiman was known in the Ottoman Empire as Suleiman Kanuni, due to his code of laws. Sharia, Islamic law or Sharia law is a religious law forming part of the Islamic tradition. It is derived from the religious precepts of Islam, particularly the Quran and the Hadith. In Arabic, the term sharīʿah refers to God's immutable divine law and is contrasted with fiqh, which refers to its human scholarly interpretations. The manner of its application in modern times has been a subject of dispute between Muslim fundamentalists and modernists. Hurrem Sultan, often called Roxelana, was the chief consort and legal wife of the Ottoman Sultan Süleyman the Magnificent. 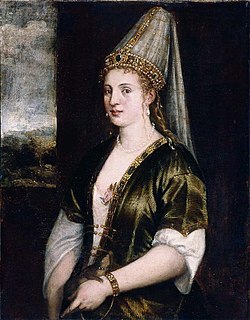 She had six children with Süleyman: Şehzade Mehmed, Mihrimah Sultan, Şehzade Abdullah, Sultan Selim II, Şehzade Bayezid, and Şehzade Cihangir. She became one of the most powerful and influential women in Ottoman history and a prominent and controversial figure during the era known as the Sultanate of Women. She was the first ever "Haseki Sultan" when her husband, Süleyman I, reigned as the Ottoman sultan. She achieved power and influenced the politics of the Ottoman Empire through her husband and played an active role in the state affairs of the Empire. Harem, also known as zenana in the Indian subcontinent, properly refers to domestic spaces that are reserved for the women of the house in a Muslim family. This private space has been traditionally understood as serving the purposes of maintaining the modesty, privilege, and protection of women. A harem may house a man's wife — or wives and concubines, as in royal harems of the past — their pre-pubescent male children, unmarried daughters, female domestic workers, and other unmarried female relatives. In former times some harems were guarded by eunuchs who were allowed inside. The structure of the harem and the extent of monogamy or polygamy has varied depending on the family's personalities, socio-economic status, and local customs. Similar institutions have been common in other Mediterranean and Middle Eastern civilizations, especially among royal and upper-class families, and the term is sometimes used in other contexts. Ruthenians and Ruthenes are Latin exonyms formerly used in Western Europe for the ancestors of modern East Slavic peoples, especially the Rus' people with a Ruthenian Greek Catholic religious background and Orthodox believers who lived outside the Rus'. In 1535, Charles V led a Holy League of 27,000 soldiers (10,000 Spaniards, 8,000 Italians, 8,000 Germans, and 700 Knights of St. John)  to victory against the Ottomans at Tunis, which together with the war against Venice the following year, led Suleiman to accept proposals from Francis I of France to form an alliance against Charles. In 1538, the Spanish fleet was defeated by Barbarossa at the Battle of Preveza, securing the eastern Mediterranean for the Turks for 33 years, until the defeat at the Battle of Lepanto in 1571. [ citation needed ] East of Morocco, huge Muslim territories in North Africa were annexed. The Barbary States of Tripolitania, Tunisia and Algeria became autonomous provinces of the Empire, serving as the leading edge of Suleiman's conflict with Charles V, whose attempt to drive out the Turks failed in 1541. 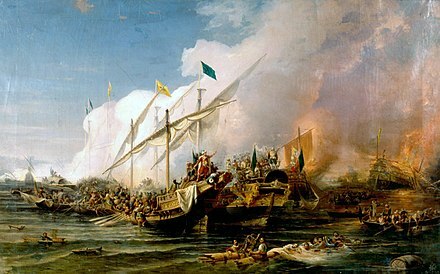 The piracy carried on thereafter by the Barbary pirates of North Africa can be seen in the context of the wars against Spain. Süleymaniye Mosque in Istanbul, built by Mimar Sinan, Suleiman's chief architect. Safiye Hanim Sultan, (died Istanbul buried in Mihrimah Sultan Mosque Edirnekapı) married in 1576 to Ciğalazade Sinan Pasha. 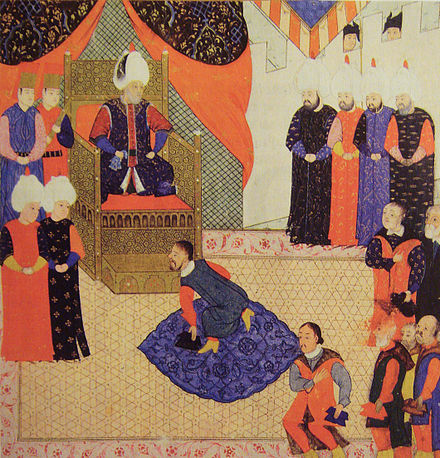 Suleiman awaits the arrival of his Grand Vizier Pargalı Ibrahim Pasha at Buda, 1529. Ottoman sultani manufactured during the reign of Suleiman the Magnificent. Cihangir is said to have died of grief a few months after the news of his half-brother's murder. The two surviving brothers, Selim and Bayezid, were given command in different parts of the empire. Within a few years, however, civil war broke out between the brothers, each supported by his loyal forces. With the aid of his father's army, Selim defeated Bayezid in Konya in 1559, leading the latter to seek refuge with the Safavids along with his four sons. 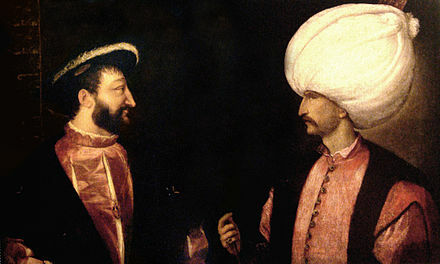 Following diplomatic exchanges, the Sultan demanded from the Safavid Shah that Bayezid be either extradited or executed. In return for large amounts of gold, the Shah allowed a Turkish executioner to strangle Bayezid and his four sons in 1561,  clearing the path for Selim's succession to the throne five years later. Through the distribution of court patronage, Suleiman also presided over a Golden Age in Ottoman arts, witnessing immense achievement in the realms of architecture, literature, art, theology and philosophy. Today the skyline of the Bosphorus and of many cities in modern Turkey and the former Ottoman provinces, are still adorned with the architectural works of Mimar Sinan. One of these, the Süleymaniye Mosque, is the final resting place of Suleiman: he is buried in a domed mausoleum attached to the mosque. 1 2 Ágoston, Gábor (2009). "Süleyman I". In Ágoston, Gábor; Bruce Masters (eds.). Encyclopedia of the Ottoman Empire. p. 541. 1 2 Ágoston, Gábor (2009). "Süleyman I". In Ágoston, Gábor; Bruce Masters (eds.). Encyclopedia of the Ottoman Empire. p. 545. ↑ "Kanuni kadar romantik ve edip biri yoktur". MЭLLЭYET HABER – TЬRKЭYE'NЭN HABER SЭTESЭ. ↑ Ágoston, Gábor (2009). "Süleyman I". In Ágoston, Gábor; Bruce Masters (eds.). Encyclopedia of the Ottoman Empire. pp. 541–45. ↑ Finkel, Caroline (2005). Osman's Dream: The Story of the Ottoman Empire 1300–1923. Basic Books. p. 145. ISBN 978-0-465-02396-7. Tezcan, Baki (2010). The Second Ottoman Empire: Political and Social Transformation in the Early Modern Period. Cambridge University Press. p. 9. ISBN 978-1-107-41144-9. Ottomanist historians have produced several works in the last decades, revising the traditional understanding of this period from various angles, some of which were not even considered as topics of historical inquiry in the mid-twentieth century. Thanks to these works, the conventional narrative of Ottoman history – that in the late sixteenth century the Ottoman Empire entered a prolonged period of decline marked by steadily increasing military decay and institutional corruption – has been discarded. [...] As observed by Douglas Howard, Ottoman decline became an "untrue myth." ↑ Şahin, Kaya (2013). Empire and Power in the Reign of Süleyman: Narrating the Sixteenth-Century Ottoman World. Cambridge: Cambridge University Press. p. 11. Tezcan, Baki (2010). The Second Ottoman Empire: Political and Social Transformation in the Early Modern Period. Cambridge University Press. p. 10. ISBN 978-1-107-41144-9. ↑ "Suleyman the Magnificent". Oxford Dictionary of Islam. Oxford University Press. 2004. ↑ Cemal Kafadar (1993). "The Myth of the Golden Age: Ottoman Historical Consciousness in the Post-Süleymânic Era". In İnalcık, Halil; Cemal Kafadar (eds.). Süleyman the Second [i.e. the First] and His Time. Istanbul: The Isis Press. p. 41. ISBN 975-428-052-5. ↑ Heath Lowry (1993). "Süleymân's Formative Years in the City of Trabzon: Their Impact on the Future Sultan and the City". In İnalcık, Halil; Cemal Kafadar (eds.). Süleyman the Second [i.e. the First] and His Time. Istanbul: The Isis Press. p. 21. ISBN 975-428-052-5. ↑ Alan Fisher (1993). "The Life and Family of Süleymân I". In İnalcık, Halil; Cemal Kafadar (eds.). Süleymân The Second [i.e. the First] and His Time. Istanbul: Isis Press. p. 9. ISBN 975-428-052-5. ↑ Barber, Noel (1973). The Sultans. New York: Simon & Schuster. p. 36. ISBN 0-7861-0682-4. ↑ Quoted in Alan Fisher (1993). "The Life and Family of Süleymân I". In İnalcık, Halil; Cemal Kafadar (eds.). Süleymân The Second [i.e. the First] and His Time. Istanbul: Isis Press. p. 2. ISBN 975-428-052-5. ↑ Bunting, Tony. 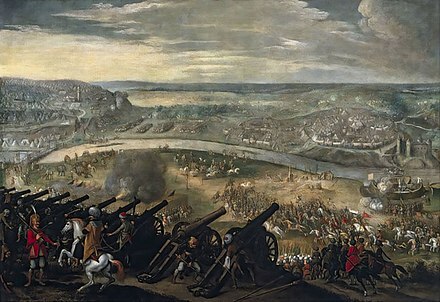 "Siege of Rhodes". Encyclopedia Britannica. Retrieved 10 April 2018. ↑ Publishing, D. K. (1 October 2009). "War: The Definitive Visual History". Penguin – via Google Books. 1 2 3 4 Clodfelter, Micheal (9 May 2017). "Warfare and Armed Conflicts: A Statistical Encyclopedia of Casualty and Other Figures, 1492–2015, 4th ed". McFarland – via Google Books. ↑ Turnbull, Stephen (2003). The Ottoman Empire 1326–1699. New York: Osprey Publishing. p. 50. ↑ Burak, Guy (2015). The Second Formation of Islamic Law: The Ḥanafī School in the Early Modern Ottoman Empire. Cambridge: Cambridge University Press. p. 1. ISBN 978-1-107-09027-9. ↑ [ "The Encyclopedia of World History". Bartleby.com. Archived from the original on 18 September 2002. 1 2 3 Kinross, 236. 1 2 Azmi Özcan (1997). Pan-Islamism: Indian Muslims, the Ottomans and Britain, 1877–1924. BRILL. pp. 11–. ISBN 978-90-04-10632-1 . Retrieved 30 September 2012. ↑ Farooqi, N. R. (1996). "Six Ottoman documents on Mughal-Ottoman relations during the reign of Akbar". Journal of Islamic Studies. 7 (1): 32–48. doi:10.1093/jis/7.1.32. ↑ Naimur Rahman Farooqi (1989). Mughal-Ottoman relations: a study of political & diplomatic relations between Mughal India and the Ottoman Empire, 1556–1748. Idarah-i Adabiyat-i Delli. Retrieved 30 September 2012. 1 2 3 Dr Z H Kour; Z.H. Kour (27 July 2005). The History of Aden. Routledge. p. 2. ISBN 978-1-135-78114-9. ↑ İnalcik, Halil (1997). An economic and social history of the Ottoman Empire. Cambridge University Press. p. 326. ISBN 978-0-521-57456-3. ↑ Clifford, E. H. M. (1936). "The British Somaliland-Ethiopia Boundary". Geographical Journal. 87 (4): 289. doi:10.2307/1785556. JSTOR 1785556. ↑ Black, Jeremy (1996). The Cambridge Illustrated Atlas of Warfare: Renaissance to Revolution, 1492–1792, Volume 2. Cambridge University Press. p. 17. ISBN 0-521-47033-1. ↑ Georgi Mitev. "History of Malta and Gozo – From Prehistory to Independence". 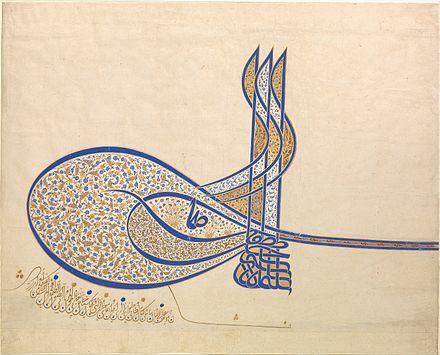 ↑ Atıl, The Golden Age of Ottoman Art Archived 6 July 2011 at Wikiwix, 24–33. ↑ Freely, John (1 July 2001). Inside the Seraglio: Private Lives of the Sultans in Istanbul. Penguin. ↑ "Ottoman". theottomans.org. Retrieved 3 February 2016. ↑ Dr Galina I Yermolenko (2013). Roxolana in European Literature, History and Culturea. Ashgate Publishing, Ltd. p. 275. ISBN 978-1-4094-7611-5. 1 2 3 Uzunçarşılı, İsmail Hakkı; Karal, Enver Ziya (1975). Osmanlı tarihi, Volume 2. Türk Tarih Kurumu Basımevi. p. 401. ↑ Peirce, Leslie P. (1993). The Imperial Harem: Women and Sovereignty in the Ottoman Empire. Oxford University Press. p. 60. ISBN 0-19-508677-5. ↑ "A 400 Year Old Love Poem". (Women in World History. ↑ "Suleiman The Magnificent" . Retrieved 19 September 2018. ↑ Turan, Ebru (2009). "The Marriage of Ibrahim Pasha (ca. 1495–1536): The Rise of Sultan Süleyman's Favorite to the Grand Vizierate and the Politics of the Elites in the Early Sixteenth-Century Ottoman Empire". Turcica. 41: 3–36. 1 2 3 Kinross, 230. ↑ Ünal, Tahsin (1961). The Execution of Prince Mustafa in Eregli. Anıt. pp. 9–22. ↑ Ágoston, Gábor (1991). "Muslim Cultural Enclaves in Hungary under Ottoman Rule". Acta Orientalia Scientiarum Hungaricae. 45: 197–98. ↑ Şahin, Kaya (2013). Empire and Power in the Reign of Süleyman: Narrating the Sixteenth-Century Ottoman World. Cambridge University Press. pp. 4–5, 250. ISBN 978-1-107-03442-6. ↑ Howard, Douglas (1988). "Ottoman Historiography and the Literature of 'Decline' of the Sixteenth and Seventeenth Centuries". Journal of Asian History. 22: 54–5, 64. ↑ Howard, Douglas (1988). "Ottoman Historiography and the Literature of 'Decline' of the Sixteenth and Seventeenth Centuries". Journal of Asian History. 22: 73–77. ↑ "No Fear Shakespeare: The Merchant of Venice: Act 2, Scene 1, Page 2". nfs.sparknotes.com. ↑ "Shakespeare's Merchant: St Antony and Sultan Suleiman – The Merchant Of Venice – Shylock". Scribd. ↑ Russell, The Age of Sultan Suleyman. ↑ Ágoston, Gábor (2009). "Süleyman I". In Ágoston, Gábor; Bruce Masters (eds.). Encyclopedia of the Ottoman Empire. p. 542. Ahmed I was the Sultan of the Ottoman Empire from 1603 until his death in 1617. Ahmed's reign is noteworthy for marking the end of the Ottoman tradition of royal fratricide; henceforth Ottoman rulers would no longer execute their brothers upon accession to the throne. He is also well known for his construction of the Blue Mosque, one of the most famous mosques in Turkey. Ahmed II was the Sultan of the Ottoman Empire from 1691 to 1695. Ahmed II was born at Topkapı Palace, Constantinople, the son of Sultan Ibrahim (1640–48) by Muazzez Sultan, and succeeded his brother Suleiman II (1687–91) in 1691. Murad III was the Sultan of the Ottoman Empire from 1574 until his death in 1595. Mehmed III was Sultan of the Ottoman Empire from 1595 until his death in 1603. Selim II, also known as Sarı Selim or Sarhoş Selim, was the Sultan of the Ottoman Empire from 1566 until his death in 1574. He was a son of Suleiman the Magnificent and his wife Hürrem Sultan. Selim had been an unlikely candidate for the throne until his brother Mehmed died of smallpox, his half-brother Mustafa was strangled to death by the order of his father, his brother Cihangir died of grief at the news of this latter execution, and his brother Bayezid was killed in a coordinated effort between him and his father. Mustafa II was the Sultan of the Ottoman Empire from 1695 to 1703. Şehzade Mustafa Muhlisi was the eldest son of the Ottoman Sultan Suleiman the Magnificent and his chief consort Mahidevran Sultan. He was the prince-governor of Manisa from 1533 to 1541, of Amasya from 1541 to 1549 and of Konya from 1549 to 1553. Şehzade Mustafa was the heir apparent to the Ottoman throne and a very popular prince among the army prior to his execution, by order of his father, which he later regretted. Ibrahim was the Sultan of the Ottoman Empire from 1640 until 1648. He was born in Istanbul the son of Ahmed I by Valide Kösem Sultan, an ethnic Greek originally named Anastasia. Mehmed IV was the Sultan of the Ottoman Empire from 1648 to 1687. He came to the throne at the age of six after his father was overthrown in a coup. Mehmed went on to become the second longest reigning sultan in Ottoman history after Suleiman the Magnificent. While the first and last years of his reign were characterized by military defeat and political instability, during his middle years he oversaw the revival of the empire's fortunes associated with the Köprülü era. Mehmed IV was known by contemporaries as a particularly pious ruler, and was referred to as gazi, or "holy warrior" for his role in the many conquests carried out during his long reign. Under his reign the empire reached the height of its territorial expansion in Europe. From a young age he developed a keen interest in hunting, for which he is known as avcı. In 1687 Mehmed was overthrown by soldiers disenchanted by the course of the ongoing War of the Holy League. He subsequently retired to Edirne, where he resided until his natural death in 1693. Mustafa III was the Sultan of the Ottoman Empire from 1757 to 1773. He was a son of Sultan Ahmed III (1703–30) and was succeeded by his brother Abdul Hamid I (1774–89). He was born in Edirne Palace. His mother was Mihrişah Kadın. Safiye Sultan, was the consort of Murad III and Valide Sultan of the Ottoman Empire as the mother of Mehmed III. Safiye was also one of the eminent figures during the era known as the Sultanate of Women. She lived in the Ottoman Empire as a courtier during the reigns of seven sultans: Suleiman the Magnificent, Selim II, Murad III, Mehmed III, Ahmed I, Mustafa I, and Osman II. Rüstem Pasha Opuković was a Croatian born Ottoman statesman. He served as the grand vizier of sultan Suleiman the Magnificent. Rüstem Pasha is also known as Damat Rüstem Pasha as a result of his marriage to the sultan's only daughter, Mihrimah sultan. He is known as one of the most influential and successful grand viziers of the Ottoman Empire. He was the wealthiest grand vizier in history. Mihrimah Sultan was an Ottoman princess, the daughter of Ottoman Sultan Suleiman the Magnificent and his legal wife, Hürrem Sultan. She was the most powerful imperial princess in Ottoman history and one of the prominent figures during the Sultanate of Women. Şehzade Bayezid was an Ottoman prince as the son of Sultan Suleiman the Magnificent and his legal wife Hürrem Sultan. After the death of three of Suleiman's sons, only Bayezid and Selim were alive. Bayezid had a good skill in military tactic. After the death of Sehzade Mustafa Bayezid became the popular heir to the Ottoman throne among the army. Through the 1550s, when Suleiman was already in his 60s, a protracted competition for the throne between Bayezid and Selim was evident. Bayezid had fallen into disfavor with his father – who was angered by Bayezid's disobedience stemming from around the same years – as opposed to his brother Selim. 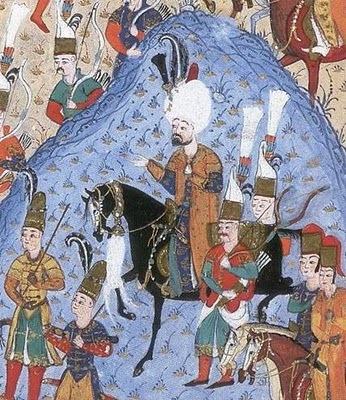 After being defeated in a battle near Konya in 1559 by Selim and Sokullu Mehmet Pasha, he fled to the neighbouring Safavid Empire, where he was lavishly received by Tahmasp I. However, in 1561, on the continuous insistence of the Sultan throughout his son's exile, and after several large payments, Tahmasp allowed Bayezid to be executed by agents of his own father. 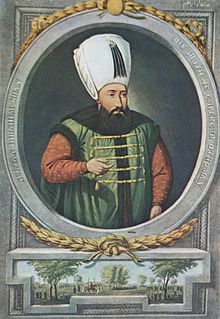 Şehzade Mehmed was an Ottoman prince (şehzade), son of Sultan Suleiman the Magnificent and Hürrem Sultan. He was assigned to rule in Manisa after his brother Şehzade Mustafa was sent to Amasya from there. Mahidevran Hatun was the consort of Suleiman the Magnificent of the Ottoman Empire and the mother of Şehzade Mustafa. Rabia Sultan was a consort of Sultan Ahmed II of the Ottoman Empire. 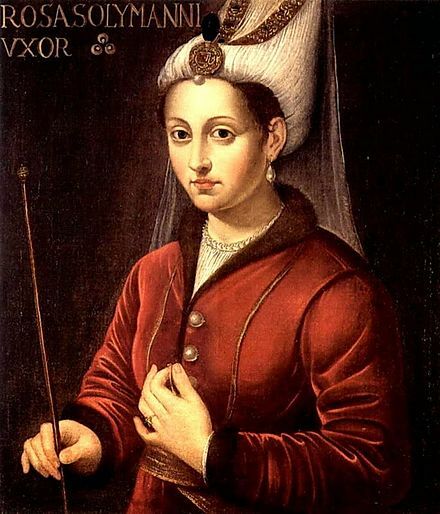 Hümaşah Sultan was an Ottoman princess, the daughter of Şehzade Mehmed, the son of Sultan Suleiman the Magnificent and his wife, Hürrem Sultan. Ágoston, Gábor (1991). "Muslim Cultural Enclaves in Hungary under Ottoman Rule". Acta Orientalia Scientiarum Hungaricae. 45: 181–204. Ágoston, Gábor (2009). "Süleyman I". In Ágoston, Gábor; Bruce Masters (eds.). Encyclopedia of the Ottoman Empire. pp. 541–7. Ahmed, Syed Z (2001). The Zenith of an Empire : The Glory of the Suleiman the Magnificent and the Law Giver. A.E.R. Publications. ISBN 978-0-9715873-0-4. Atıl, Esin (1987). The Age of Sultan Süleyman the Magnificent. Washington, D.C.: National Gallery of Art. ISBN 978-0-89468-098-4. Atıl, Esin (July – August 1987). "The Golden Age of Ottoman Art". Saudi Aramco World. Houston, Texas: Aramco Services Co. 38 (4): 24–33. ISSN 1530-5821. Archived from the original on 6 July 2011. Retrieved 18 April 2007. Barber, Noel (1976). Lords of the Golden Horn : From Suleiman the Magnificent to Kamal Ataturk. London: Pan Books. ISBN 978-0-330-24735-1. Burak, Guy (2015). The Second Formation of Islamic Law: The Ḥanafī School in the Early Modern Ottoman Empire. Cambridge: Cambridge University Press. ISBN 978-1-107-09027-9. Clot, André (1992). Suleiman the Magnificent : The Man, His Life, His Epoch. London: Saqi Books. ISBN 978-0-86356-126-9. Greenblatt, Miriam (2003). Süleyman the Magnificent and the Ottoman Empire. New York: Benchmark Books. ISBN 978-0-7614-1489-6. Howard, Douglas (1988). "Ottoman Historiography and the Literature of 'Decline' of the Sixteenth and Seventeenth Centuries". Journal of Asian History. 22: 52–77. Imber, Colin (2002). The Ottoman Empire, 1300–1650 : The Structure of Power. New York: Palgrave Macmillan. ISBN 978-0-333-61386-3. Kafadar, Cemal (1993). "The Myth of the Golden Age: Ottoman Historical Consciousness in the Post-Süleymânic Era". In İnalcık; Cemal Kafadar, Halil (eds.). Süleyman the Second [i.e. the First] and His Time. Istanbul: The Isis Press. pp. 37–48. ISBN 975-428-052-5. Kinross, Patrick (1979). The Ottoman centuries: The Rise and Fall of the Turkish Empire. New York: Morrow. ISBN 978-0-688-08093-8. Labib, Subhi (November 1979). "The Era of Suleyman the Magnificent: Crisis of Orientation". International Journal of Middle East Studies. London: Cambridge University Press. 10 (4): 435–51. ISSN 0020-7438. Lamb, Harold (1951). Suleiman, the Magnificent, Sultan of the East. Garden City, NY: Doubleday. ISBN 1-4067-7271-2. OCLC 397000. Levey, Michael (1975). The World of Ottoman Art. Thames & Hudson. ISBN 0-500-27065-1. Lewis, Bernard (2002). What Went Wrong? : Western Impact and Middle Eastern Response. London: Phoenix. ISBN 978-0-7538-1675-2. Mansel, Phillip (1998). Constantinople : City of the World's Desire, 1453–1924. New York: St. Martin's Griffin. ISBN 978-0-312-18708-8. McCarthy, Justin (1997). The Ottoman Turks: An Introductory History to 1923. London: Routledge. ISBN 978-0-582-25655-2. Merriman, Roger Bigelow (1944). Suleiman the Magnificent, 1520–1566. Cambridge, Massachusetts: Harvard University Press. ISBN 1-4067-7272-0. OCLC 784228. Severy, Merle (November 1987). "The World of Süleyman the Magnificent". National Geographic. Washington, D.C.: National Geographic Society. 172 (5): 552–601. ISSN 0027-9358. Şahin, Kaya (2013). Empire and Power in the Reign of Süleyman: Narrating the Sixteenth-Century Ottoman World. Cambridge: Cambridge University Press. Sicker, Martin (2000). 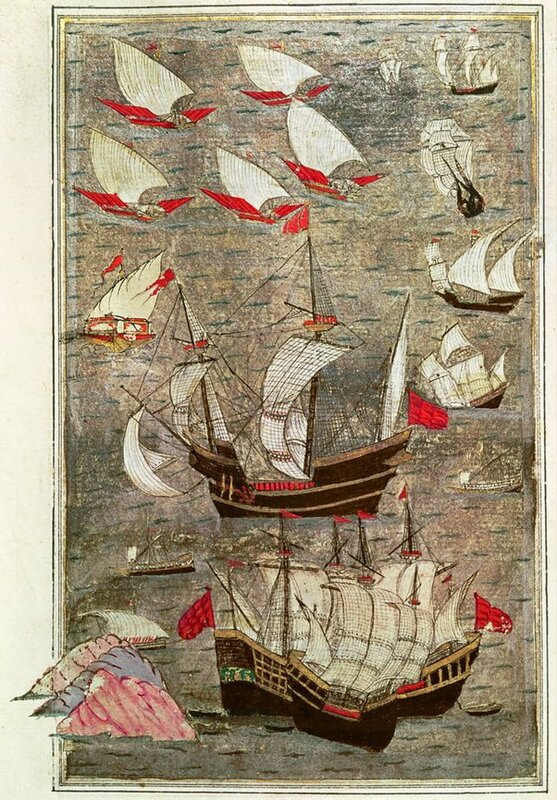 The Islamic World In Ascendancy : From the Arab Conquests to the Siege of Vienna. Westport, Connecticut: Praeger. ISBN 978-0-275-96892-2. Tezcan, Baki (2010). The Second Ottoman Empire: Political and Social Transformation in the Early Modern World. Cambridge: Cambridge University Press. ISBN 978-1-107-41144-9. Turan, Ebru (2009). "The Marriage of Ibrahim Pasha (ca. 1495–1536): The Rise of Sultan Süleyman's Favorite to the Grand Vizierate and the Politics of the Elites in the Early Sixteenth-Century Ottoman Empire". Turcica. 41: 3–36. "Suleiman The Lawgiver". Saudi Aramco World. Houston, Texas: Aramco Services Co. 15 (2): 8–10. March – April 1964. ISSN 1530-5821. Archived from the original on 5 May 2014. Retrieved 18 April 2007. Woodhead, Christine (2011). The Ottoman World. Routledge. ISBN 978-0-415-44492-7. "1548–49". The Encyclopedia of World History. 2001. Retrieved 18 April 2007. "A 400 Year Old Love Poem". Women in World History Curriculum Showcase. Retrieved 18 April 2007. Halman, Talat (1988). "Suleyman the Magnificent Poet". Archived from the original on 9 March 2006. Retrieved 18 April 2007. "The History of Malta". 2007. Archived from the original on 1 May 2007. Retrieved 27 April 2007. "Muhibbî (Kanunî Sultan Süleyman)". Türkçe Bilgi—Kim kimdir? (in Turkish). Retrieved 13 January 2008. Russell, John (26 January 2007). "The Age of Sultan Suleyman". New York Times. Retrieved 9 August 2007. Yapp, Malcolm Edward (2007). "Suleiman I". Microsoft Encarta. Archived from the original on 3 October 2008. Retrieved 17 April 2008. İnalcık, Halil; Cemal Kafadar, eds. (1993). Süleyman the Second [i.e. the First] and His Time. Istanbul: The Isis Press. ISBN 975-428-052-5. Wikimedia Commons has media related to Suleiman I .